Minimize waste and choose the perfectly-sized towel for soaking up messes and spills with these Plenty ultra premium flex-a-size paper towels! Featuring a super-absorbent 2-ply design, the towels will ensure that your restaurant, office, hotel, or other business maintains a tidy presentation! The convenient perforation minimizes waste by allowing you to select the perfect towel size based on the severity of each spill. Whether you're dealing with a single or multiple-sheet mess, these towels' strength, absorbency, and softness will take care of the job! Like most households we use a lot of paper towels. Buying they in bulk on webstaurnt has saved a lot of money. they paper towels are great quality too. I prefer the elegant 2-ply paper towel roll-30/case over the plenty. I ran out in the blank of an eye abut the quality was good. we like this paper towels, they are very absorbent, they do not leave anyresidue, its very resistand paper towels. Its perfect to use in Restaurants or at home. These paper towels are wonderful! Affordable and easy to use whats needed since you can use one small sheet for smaller tasts or 2 small sheets to make up a whole big sheet for bigger messes. The roll is large and thick. They are soft and absorbent. I would recommend these. These are great paper towels. Works just as well as most brand names. I love the select a size. I would definitely recommend this product! This Ultra paper towel is quality product and great price! They are just as good as the national brands. They hold up well. Give them a try and save. We give 4 Stars! These are very good quality and a great buy. I use them in our break room and in our warming kitchen and for our bar. These paper towels are much larger than we had expected and that is fantastic! They are super durable and absorbent for cleaning up spills, messes and debris free when using them on mirror! I go through paper towels like crazy. I use mine to let my strawberries dry after being rinsed. They hold up just as well as most name brand towels. This Plenty ultra premium 2-ply flex-a-size paper towel is surprisingly as good as the best branded paper towels out there. They are perfect for cleaning up messes or for drying things out out. Anything that you need a paper towel for. the right towel for the quick jobs. These paper towels get the job done in and around your church kitchen. The price point is just right for us as well. The plenty 2 ply flex size paper towels are excellent. Comparable to other name brands. Thick and absorbent they don't fall apart when you wipe down a mess. This paper towels are similar in quality to those I purchase at a big box store but at a lower price. The problem is the rolls are much smaller so the price works out about the same. I don't feel these are really a bargain. High quality paper towels for any business, food establishment or home. Select your own towel size with perforated tear points. Very absorbent towels work great at cleaning up spills. We always purchase the 2 Ply Ultra Premium paper towels. This is the flex-a-size style which is nice because many times you can use a small piece of paper towel and the roll lasts longer. Getting paper towels shipped to our door helps us become much more efficient. These large rolls of premium paper towels are great product. These are a nice thick absorbent towel and the flex size feature allows you to use a half size sheet or a full sheet. These are great! The "flex-a-size" allows you to grab half sheets, which saves a lot of waste. They're very absorbant, and hold up extremely well. Not only are these paper towels very cheap, but they are also super absorbent. They work great for your home or business. They are amazing! These 2 Ply paper towels are great! Can definitely tell that they are more of a premium quality. They hold up much more when they are wet which makes cleaning much easier. The 2-Ply Ultra Premium Flex-A-Size Paper Towels are great for wiping hands and cleaning up spills. The quality is excellent and the price is very reasonable. I highly recommend this product and would purchase again. These are high quality paper towels. They are strong and sturdy and don’t leave lint behind. I will keep repurchasing the Plenty brand from Webstaurant. 2-Ply Ultra Premium Flex-A-Size Paper Towels - 12/Case are THE BEST paper towels on this site, they blow leading competitors out of the water, I'm serious you should spend a few extra dollars because the quality is top notch. These are excellent paper towels. The flex-a size sheets are a convenient size. 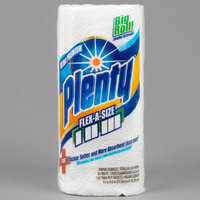 2 flex sheets are a little larger than your standard size paper towel. The paper towels are strong and the package is a good value. These 2-Ply Ultra Premium Flex-A-Size Paper Towels - 12/Case are such a great purchase. They are very absorbent and good to clean any type and size mess. I use it all over the house...I love it. These are a great alternative to more expensive name brands. I don't think they are quite as strong and thick, but they serve their purpose & i will surely repurchase these in the future. I find myself typically using one extra "flex-a-size" piece compared to what i was using in store bough name brands. over all, they are great & i recommend for day to day use. i also like that they are all individually packaged! Great paper towels here. They have never torn nor ripped even under the most difficult situations. 12 mega rolls which is the equivalent if 16 regular rolls! i've tried most of the different brands of paper towels sold here on webstaurant and these are both soft and sturdy. probably the best of the bunch. i like that i can get them in bulk or just per roll if needed. Our kitchen volunteers are very satisfied with these nice, thick paper towels. They are absorbent, and I think the flex-s-size feature helps us not waste them. They are twice as expensive as the cheap ones we were buying before, but they are a good value compared to buying the name brand at the supermarket. They come wrapped in a sturdy plastic bag type packaging (with individually-wrapped rolls inside that), not a box. If your people like the high quality name brand items, this is for you. We still buy the cheaper ones for some uses, so we keep everyone happy, both the thrifty ones and those with high standards. This product is amazing, we use it everyday! We love this product and regularly use this because it keeps the messes from getting bigger to easily soak up the mess we have made. This premium paper towels are the best! Paper is really thick and absorb water well, you can also take advantage of flex sized sheets of towels! Such great paper towels so perfect to have around the house. Love that you can get a small sheet or a larger one depending on your needs. Sir Clean recommend this product 2-Ply Ultra Premium Flex-A-Size Paper Towels - 12/Case, we like because the towels absorb immediately . You can use to many purpose. I think half-size paper towels are so much more convenient than full-size. Plus they're less wasteful. These are good quality paper towels that are very absorbent. Good price too. These paper Towel are great. I use them for home use. From wiping the counter to using at dinner. They are very absorbent and come at a good price. This is my go-to brand. It is a dependable product, sturdy, and gets cleaning done with one towel. I really like the flex-size since it uses less paper, meaning less waste. Plus, your roll lasts longer. Great value! This paper towel gets the job done! Great price for a good product. I love that it comes in select a size sheets. Great value. These are in the middle to high end part of the paper towel realm. The hold up pretty well and can be reused for wiping down the counter or whatever is sanitary to reuse for. I usually keep a few in my pocket for any mess that comes up. What I like in particular is they are the half sheets making it perfect for drying hands and just right for wiping down plates and utensils. This is a great way to stay stocked up on paper towels. The towels are as nice as a brand name but at a fraction of the cost. These paper towels came in bundles of two rolls wrapped together. While this would not be a problem in a home, this could be an issue for storage in closets during winters when rodents will readily take any paper they can. Great paper towels though. We ended up storing these high on cabinets to avoid future problems. This brand is great! I love that we can select the size we need for the job at hand. But first and foremost these are super absorbent and work great! This is the only brand that we use now and we will continue to use. Plenty is an awesome brand that we were not aware of until we ran across it on WebStaurant. We have to say it is some of the best value, best usable paper towels we have used anywhere. You may purchase by the roll or by the case, but it will stand up to any leading brand. We will not buy anymore paper towels unless they come from Plenty. What can you really say about a roll of paper towels? This is a good product for the price. Absorbs well and is an all around good product for what it is. Love, love these paper towels! They are a bright white, they are strong and holds together when wet and clean up jobs. I like being able to pick a size for the occasion. Good quality towels. I was looking for something that would work as well as Bounty does, and this a good replacement, for a better price. I'll buy this again and again. You don't realize how much you save till you start using smaller paper towels and not just accepting the large sheeted ones. Good paper towels. Nice texture and absorbent. Rolls are on the smaller side. Good price for good product, definitely better than most places. good product. I have bought a brand named paper towel with the same select a size option and its hard to tell the difference. As far as quality its comparable to the brand name. Great paper towels for a great low price. Why would you buy the brand name if these are just as good! They soak up almost just as much as bounty towels and are cheaper so I feel like this is more of a bargain.